I left out the cranberries from this week’s Tuesdays with Dorie recipe. I couldn’t find fresh or frozen ones anywhere! To be honest, fresh cranberries are not something I see too often in our stores. Plenty of dried cranberries! Especially Craisins! They’re actually very popular as a healthy snack. But no fresh ones, so I left them out! So it’s going to be short n sweet! I didn’t particularly like this bread. I was excited to make it, baking with pumpkin isn’t a big Aussie thing (unless I’m missing something?)! I love the idea of desserts with pumpkin! We tend to keep pumpkin as something you serve alongside a meal or in a salad. So this recipe was new and exciting for me! Having said that I found the taste bland. Maybe more sugar would have helped? I’m looking forward to reading everyone’s tips once we get back! Rebecca has the full recipe for you at This Bountiful Backyard if you’d like to check it out! Tags: baking, bread, cooking, food, pumpkin, recipes, Tuesdays with Dorie | Permalink. Looks like you are having much more fun than I am! Enjoy. We enjoyed the bread–fresh cranberries give it a fun tang. I like all things pumpkin but I have not had it in a salad. Pumpkin is usually the base of a dessert at our house. My kids love pumpkin chocolate chip cookies and pumpkin pie. Pumpkin cheesecake is wonderful. You made a perfect loaf with perfect slices! Hope you had a fun weekend! I haven’t been to an amusement park in forever. Baking with pumpkin is super awesome – try making some pumpkin quick bread or muffins and I think you’ll get the taste you’re looking for. I miss eating pumpkin the way you do – I did a semester in NZ and my host parents made roast pumpkin almost every night with dinner. Yum! We don’t have the same kind of pumpkins here – I’ve tried to replicate it. I made them a pumpkin pie once when I was there and they were amazed by how good it was because they’d never eaten pumpkin that way. I didn’t really like this one either. I think pumpkin is ok, but you can’t taste it here. All I could taste is the cranberries and they were too strong. I agree–the flavor was pretty much the same as raisin bread. Your’s looks great though! Your loaf looks beautiful but it’s a pity you did not like this bread. Try to add some more sugar and make it sweeter, in my opinion it’s better. Your bread came out beautifully. I think cranberries are an acquired taste. I wish I had chopped mine a bit to disperse the flavor more, your breads are beautiful! I think you needed the cranberries for flavor. They really added zing and a nice contrast to the slightly sweet loaf. 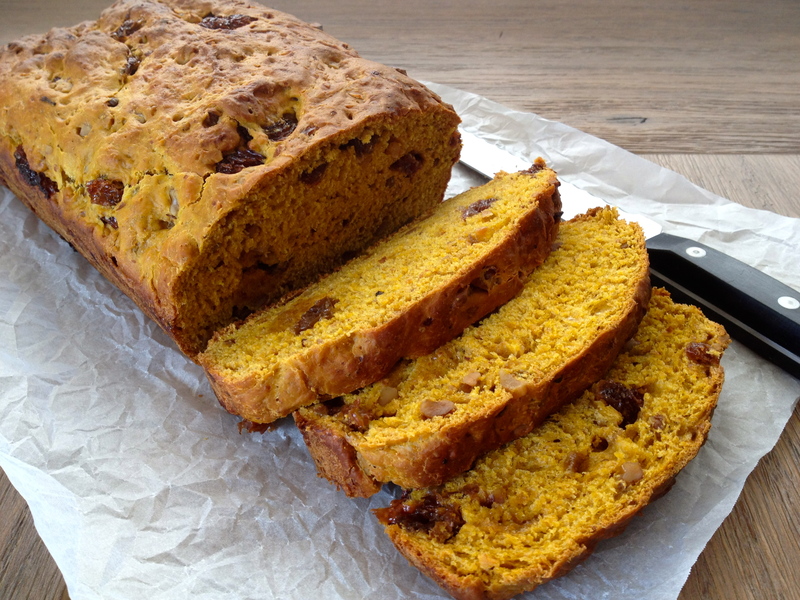 The warm color of your Pumpkin Loaf is wonderful – I could not find fresh cranberries anywhere around here either and opted for dried ones as well as dried cherries – we also toasted a few slices and ate them slathered with butter – maybe that helps the taste along a bit. I think cranberries are very American, so I’m not surprised you didn’t see them around you. We usually only see them for Thanksgiving (all very American) and then until they run out, usually before Christmas. I liked the bread itself, but didn’t actually like the fresh cranberries. Next time, I would use the craisins.